I warned you in my last post that you would be seeing more apple recipes coming you way and here you have it! I knew when I went apple picking that I would need to try my hand at baking my very first apple pie. I could have made a hundred different dishes with exotic flavors from complicated recipes, but there is just nothing more comforting than a warm homemade apple pie. The smell of cinnamon and nutmeg coming from the oven was enough to make me a very impatient baker. They say a watched pot never boils, but I will add that a watched pie never browns! As you probably guessed from the Greek letters, I am a Sigma Kappa Sorority alumnae. Although I graduated college some years ago, I am still very active as both an advisor and alumnae chapter officer. 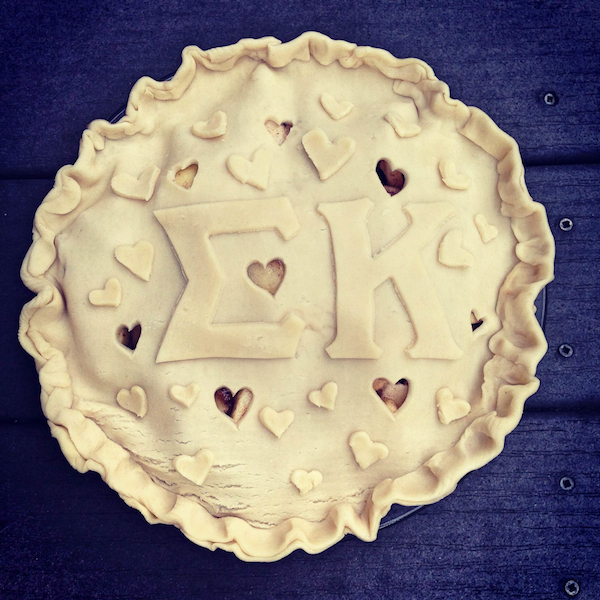 Since my trip to the apple orchards was part of an alumnae chapter event, I decided to glam up my pie with a little sorority flare! I was nervous about freehand cutting hearts from the dough, but I was very pleased with the results and really think it adds a little extra charm to the finished product. I wanted to share it here, because I think (even without the letters) it would make a great fall treat for someone special, or a thoughtful gift for the host of a dinner party. Enjoy! Preheat oven to 425 degrees. Begin prepping the filling by peeling, coring and slicing your apples. In a large bowl, mix sliced apples, lemon juice, sugars, flour, vanilla, cinnamon and nutmeg. Toss until apples are evenly coated. Fill bottom pie crust with the apple mix. Roll out the top pie crust and cut out small hearts using a paring knife or very small cookie cutter. Adhere the cut out pieces of dough by brushing the back of each with a small amount of milk or water, just enough to make it sticky, but not soggy. Carefully lay the top pie crust over the filled pie and crimp the edges, hopefully a little prettier than my attempt! Place pie in oven and bake for 15 minutes to brown. Lower the temperature of the oven to 350 degrees and bake for an additional 35-45 minutes, or until golden brown. Once finished, remove the pie and transfer it to a wire rack to cool. Serve warm with fresh whipped cream. *Baking tip* After 30 minutes of baking, loosely cover the edges of the pie with a thin layer of aluminum foil to avoid over-browning.